Is There A Better Way To Track Aircraft During Flight? : The Two-Way Much of the technology we use to track a plane – like radar – is old. New technology is already out there, but their limited use and the cost of adoption are deterrents. 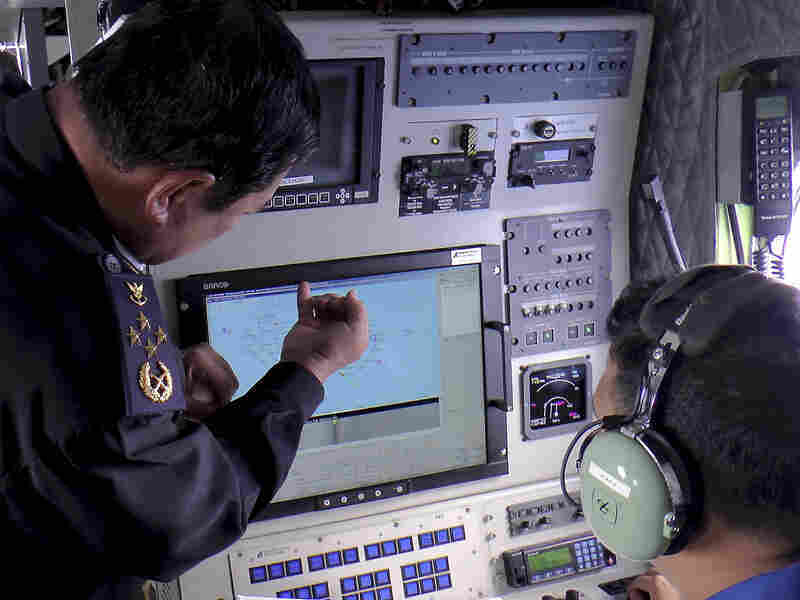 Adm. Mohd Amdan Kurish of the Malaysian Maritime Enforcement Agency Admiral, left, checks radar during a search for the missing Malaysia Airlines plane off Tok Bali Beach in Kelantan, Malaysia, on Sunday. "In this day and age, having no ability to pinpoint these aircraft is really not acceptable. We have technology to make it happen. We really need to do something ... so we can prevent the loss of aircraft." That got us thinking about how planes are tracked and if there are better ways to do it. Air traffic controllers track aircraft using radar. That technology is fine when the plane is flying over land, but its limitations are exposed when the aircraft gets over water. Additionally, radar can't spot aircraft that are flying below a certain altitude because of the Earth's curvature. The head of Malaysia's air force said Tuesday that when military radar last saw Malaysian Airlines Flight 370, it was at least 200 miles off course. Reuters notes that if that's true, "it would mean the plane was able to maintain a cruising altitude and flew for about 500 kilometers (310 miles) with its transponder and other tracking systems apparently switched off." And, The Guardian reports that the plane was equipped with ACARS, or the Aircraft Communications Addressing and Reporting System, which would automatically alert engineers at base of any mechanical failure. It's unclear if any such message was received. Todd Curtis, an aviation safety analyst who now runs the AirSafe.com Foundation, tells us that the transponder is the device on the airplane that emits a radio signal with information about the aircraft such as identification, air speed and altitude. It does this when it receives an interrogation or request signal from an air traffic control radar. Investigators say that in the case of Flight 370, the transponder disappeared suddenly. This could happen if there's a sudden loss of power or if it was switched off intentionally. GPS is so prevalent in our lives that we can use it on our phones to give us directions or map our running routes and track distances. Airplanes have GPS, too, but they don't work the way we'd expect them to. "Airlines do use GPS systems for navigation, but GPS signals are not used in the transmission from the emergency locator transmitters, or from the acoustic locator device (which activates when the device is submerged in water) that's carried by the black boxes," Curtis said. In other words, an aircraft uses GPS to track itself, but doesn't share that information with air traffic control. "We don't know the plane's position because we rely on radar for that information. If the plane isn't in view of the radar, it's position can't be detected. It's unclear how good the radar coverage was in that area although now they are saying the plane did turn and deviated from its assigned altitude." GPS is one of several systems with which large aircraft track their positions. And if for some reason it fails – it's susceptible, Ison says, to jamming or spoofing – then the plane's inertial navigation system takes over. This system, which uses very sensitive sensors to detect the plane's position based on its last-known position, is considered to be very accurate. The flight data recorder or the black box is the nearly indestructible equipment that records what goes on during a flight. Trouble is that in the event of a disaster, such as the Air France flight that crashed in the Atlantic in 2009, it can take years to find the black box and determine what led to a crash. In a piece for The Guardian, Stephen Trimble, an aviation reporter and editor for Flightglobal's Americas bureau, called black boxes a "galling anachronism of modern aviation technology." "The black box goes down with the ship, so to speak. It goes down with the aircraft," Trimble told NPR's Renee Montagne. "So all the information that we're craving right now about what happened and why, is possibly, wherever the aircraft wreckage is, possibly at the bottom of the ocean." We asked Ison what improvements can be made in how we track aircraft. He said several technologies are already available. One of them is ADS-B (which stands for automatic dependent surveillance–broadcast) in which the aircraft transmits its position to other aircraft and ground-based receivers. ADS-B can be used in place of radar in remote locations and in areas where radar installation isn't feasible, such as with receivers on oil rigs in the Gulf of Mexico. But the technology hasn't been widely adopted yet. Ison says an aircraft can also transmit its location using satellite or high-frequency radio, which can be used at long range. "Neither of these, unfortunately, are widely used at this point," he said. Curtis added that there are many good ideas that are technically feasible, "but it will take a coordinated effort by the aviation industry to implement any of these changes."